The breathtaking scenery of Alaska is an unparalleled sight, one that can arguably be best captured by taking a cruise tour. A cruise tour will package the sailing experience with an amazing adventure on land. Whether you sail round trip to Glacier Bay through the inside passage or one way across the Gulf of Alaska towards the Hubbard Glacier and College Fjord, you are guaranteed to see the majesty of Alaska in all its glory. 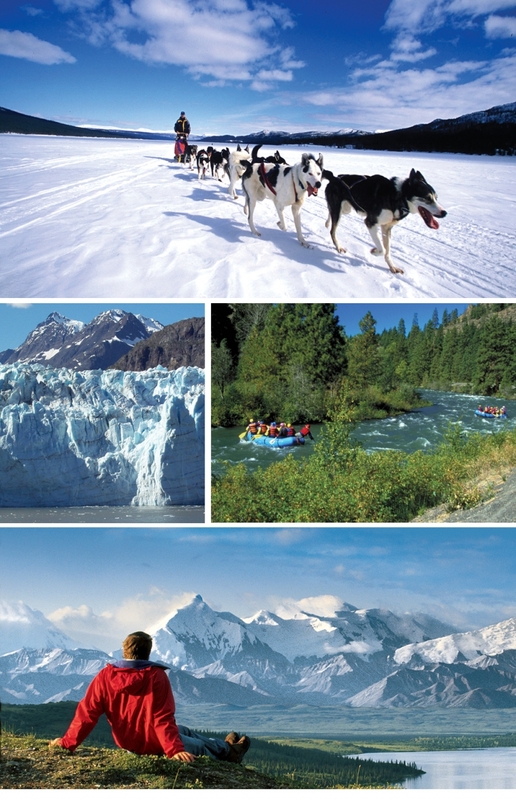 Often departing from Seattle or Vancouver, a round trip Alaskan Cruise is a relaxed itinerary. Often hitting stops such as Juneau, Skagway, Ketchikan, Sitka, Haines or Victoria (B.C.) Often, you will explore marvels such as the Tracy Arm Fjord and Sawyer Glacier. While there are some longer cruises that depart from San Francisco or San Diego, a typical weeklong cruise spends a day in the remarkable Glacier Bay. Glacier Bay is a national park, wildlife reserve, marine park and UNESCO world heritage site. Over 3 million acres of land, Glacier Bay is a spectacular sanctuary of inlets, coves, mountains, glaciers and forests. A round trip cruise offers a soothing and classic understanding of the coastal views of Alaska's coastline. An ocean view or balcony cabin is recommended, so you can lounge in your stateroom and take in the amazing views that you sail by. Of course, with a round trip itinerary, if your stateroom faces away from the coastline on the first leg, you are sure to capture the scenery on your return. There are amazing excursions in port, such as a dogsled ride, whale watching, helicopter rides or a wildlife tour. For a more indepth Alaskan experience, a one way itinerary may better suit you. You will need your flights to accommodate your departure and arrival location, and most itineraries sail between Vancouver or Seattle and Anchorage. These cruises encompass what is covered on a round trip sailing, with the additional destinations such as Valdez, Hubbard Glacier, College Fjord, or other towns along the Gulf of Alaska. If you are determined to explore all that Alaska has to offer, you can pair this itinerary with an additional land tour in Anchorage. Alaska is full of adventure. There is so much to see and explore from natural wonders to worldfamous railroad tours. The glaciers in Alaska are historic marvels, worthy of anyone's bucket list. It takes about 400 years for ice to travel the length of the Hubbard Glacier, however you can explore this marvel in a day or two. The icebergs are the size of 10 story buildings, and you will be wowed by the impressive masses across Disenchantment Bay. Anchorage is a destination worthy of exploration as well. Larger than the state of Rhode Island, this expansive city sits between the Cook Inlet and the Chugach Mountain range. If visiting in March, be sure to watch the famous Iditarod Sled Dog Race kick off downtown. There are also ski resorts, wildlife conservation centers, museums and theaters to appeal to the senses of travelers of all interest levels. A tour is the best way to get the most out of your Alaskan adventure. Tours are typically 3+ nights of exploring the Alaskan Landscape. Participating cruise lines will offer the tours as an additional package to your cruise, and provide lodging, tour guides, activities and more. When participating in a cruise tour, you will be able to seamlessly transition from land to sea, exploring deeper into the wilderness of Denali, Glacier Bay or other amazing Alaskan locations. These tours have been curated to explore various points of interest, and give you an amazing and immersive Alaskan experience unlike any other. Room with a view Be sure to have your vacation specialist book you a stateroom with viewing access. You do not want to miss the beauty of the glaciers and coastal scenery. A round trip itinerary will give you an option to see the sights regardless of which side of the ship you are on, but if going one way, be sure to factor your direction into your stateroom choice. A balcony upgrade is well worth the extra cost. Book your shore excursions ahead of time With so much to explore, it is worth planning out your time in port before you even get on the ship. Shore Excursion group has some amazing activities in Alaska, and it is often cheaper to book ahead than to book on board. Pack accordingly Be sure to bring binoculars, long camera lenses, clothing layers, boots and/or sneakers, waterproof jackets and an umbrella! There is some rugged terrain in Alaska and you should prepare for any adventure!